"Wings of the Sun Hawk"
I am Zhaawano Giizhik. 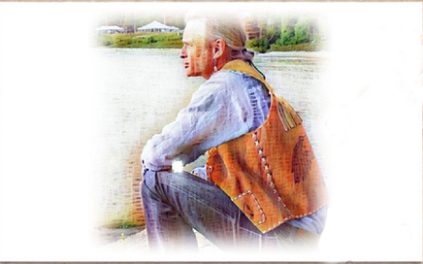 This blog story is the sixteenth already in a series titled Teachings Of The Eagle Feather, featuring my works of art along with those of kindred artists. Both my stories and my artworks seek to provide an insight into the unique izhinamowin (world view) of the Anishinaabe Peoples. The theme that connects the ring set and the paintings is the Hawk and his close relationship with both the natural world (humans, other bird species, the sun) and the realm of sky spirits; particularly the Thunder Grandfathers, who in spring and summer present themselves on earth as avian characters (Thunderbirds) and, although on rare occasions, as humans (grandfathers). Anishinaabe society is basically structured around a very intricate system of kinship - called gidoodeminaanig in the Ojibwe language, which translates into “our blood relations,” or “our clans.” Our People had originally five to seven clan or doodem groups, nowadays divided into at least sixty-five different clans (odoodeman). Each doodem, which is represented by either a bird, a fish, a land animal, body parts of an animal, a tree, or a spirit that lives in the lakes or the sky, denotes a common ancestor and makes all those who are born under its sign one in birth, function, and purpose. As they disclose norms and principles for bimaadiziwin, or living long and healthy lives, animals, as elder brothers of humans, represent the basic needs of human society. Each different animal (or spirit being) is a silent metaphor for human flaws and weaknesses; yet at the same time they seek to instill in clan members certain virtues to emulate and provide them with a set of life-long mutual kin rights and obligations to live up to. These duties and moral responsibilities, called mino-bimaadiziwin (literally: “good life”) apply to individuals and everyday life but are also understood in a communal and a spiritual sense that is far beyond the present. 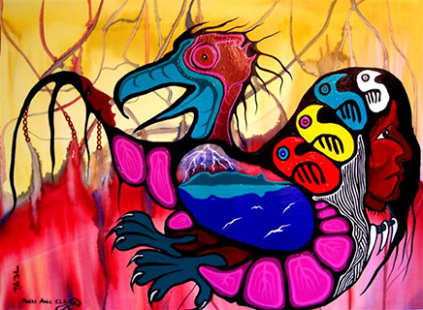 Among the Anishinaabeg, people who are born into Gekek doodem, the Hawk Clan, are known as born leaders; in daily life they tend to be initiators and, as they have the ability to soar high above, combined with an extraordinary sharp eyesight, they possess the power to catch insightful glimpses of the bigger picture – which makes them more observant than most other people and gives them a great sense of perspective. Hawk people, therefore, have the ability to look straight through other people. They are often known to be bringers of spirit messages and foretellers of change and as such help identify a transition in one's environment. Like the hawk itself, Hawk clan members intuitively know how to wait patiently in order to accomplish a goal, and once they strike at their prey (act) they make sure to do so with speed and precision. Thoughtfulness, deliberation, and averseness to corruption and nepotism are therefore virtues that you find often with Hawk clan people and they remind us to behave well and never cease to be awake and aware when it comes to moral issues like injustices and wrongdoings. Hawks hunt in groups and often mate for life; thus they challenge us to think about, and assess, the people we associate and surround ourselves with. Equally importantly, they remind us to be loyal toward the ones we love and those who depend on us. Gete-ayaa’ag, our ancestors, admired the hawk for its physical beauty, speed, endurance, perseverance, fearlesness, and sharp eyesight. They acknowledged him as a spirit grandfather who bears on his wings and brings to earth and her Peoples great wisdom, broad perspectives and a deep mental awareness. In a cosmological sense of the most sacred nature, Gekek is gekinoo'amaaged (a teacher) who teaches anishinaabeg (mankind) to live in balance with all things that support mino-bimaadiziwin, the sacred web of life. As a prominent member of the binesiwag, the Winged Ones, he draws our attention to the light of Giizis, the day-sun, and in doing this he remind us of how much we are all connected with GICHI-MANIDOO, the Great Mystery of the Universe. Giizhigoong is how the gete-ayaa’ag called the Sky World and all of its beings, corporeal as well as incorporeal. 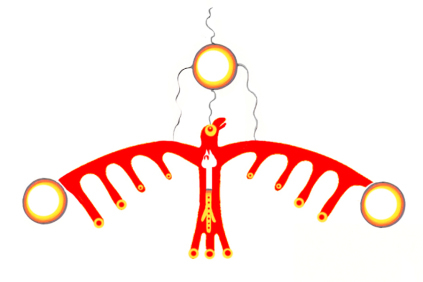 In Anishinaabe izhinamown (our traditional worldview), these aadizookaanag (grandfather-beings, or cosmic spirits; literally: "makers of sacred stories") are symbolized by the sun, the moon, the stars, and by rain and thunderclouds which represent the physical orders of the universe. Traditionally, another class of Sky Beings is represented by bineshiwag, or taloned birds of prey. Conceptually, Animkii Binesiwag, the Thunderbirds, supernatural creators of thunder and lightning, are sometimes grouped with Gekekwag (hawks) and the hawk-related bird species – like, for example, bibiigiwizens or boonose (the sparrow hawk) and gekegoons (the pidgeon hawk). Naturally, Migiziwag (bald eagles) and Giniwag (golden eagles) also play an important metaphorical role in the world of the Bird Nation; they, too - and golden eagles in particular-, are regarded as natural counterparts of the supernatural Thunderbirds. 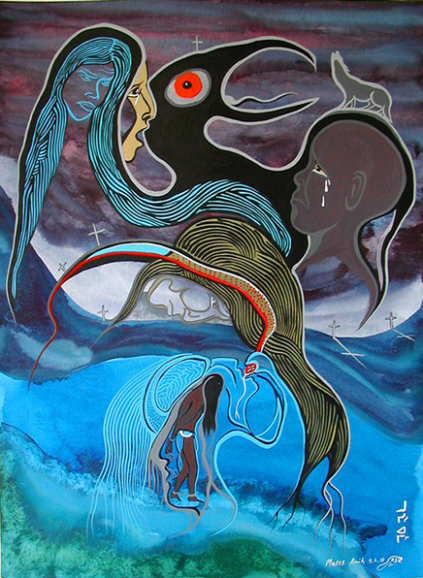 According to tradition the Thunderbirds, or “Old Men (Grandfathers) with Wings” as they are often euphemistically referred to, came to Aki, the earth, in the beginning of times to govern the quality of our People's existence, and that of the animals and plants, with supernatural powers over which the Anishinaabeg had little control. They were, directly as well as indirectly, connected with the four directions, the winds, and the seasons. They were in charge of warm weather and directed niiwing ondaanimad (the four winds) and mediated with them. Thunders became thus associated with fertility, and with the creation of clouds and rain. Thunderbirds - as conceptualized, concretized versions of the Thunders (their images often depicted through abstract imagery on ceremonial items such as drums and pipe bags) - are sent to earth to impart knowledge and foretell the future; like their natural counterparts the hawks, they perceive what lives in the hearts of human beings and punish those who have impure thoughts and live immoral lives. From another aadizookaan, the sometimes foolish but also wise teacher Wiinabozho, the Anishinaabeg learned to offer the sacred asemaa (tobacco) to the thunder Grandfathers. An act that became a customary rite through the ages and that is still practiced today. Although usually associated with hawks and eagles, Thunderbirds are also capable of metamorphosis into other beings and sometimes even endowed with a human form, mostly in the shape of omishoomisimaag (grandfathers of the human class); they were even known to sporadically mate and produce offspring among human beings… Like I mentioned before, they are also known to appear along with all the other migrating birds as soon as the winter is over, and by the time the trees shed their leaves they are believed to return to Thunder Bay - Animikii-wiikwedong, which literally means "Bay of the Thunder" in the Ojibwe language -, a large stretch of water on the north side of Lake Superior, to rest until spring arrives. 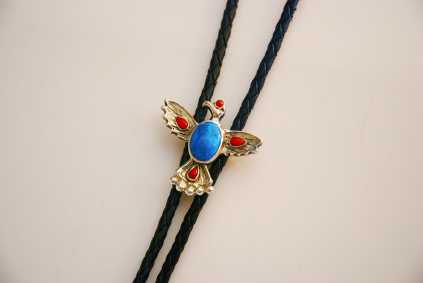 Animikii-wiikwedong is symbolized by the oval turquoise stone featuring the above bolo tie, designed and handcrafted by the author. 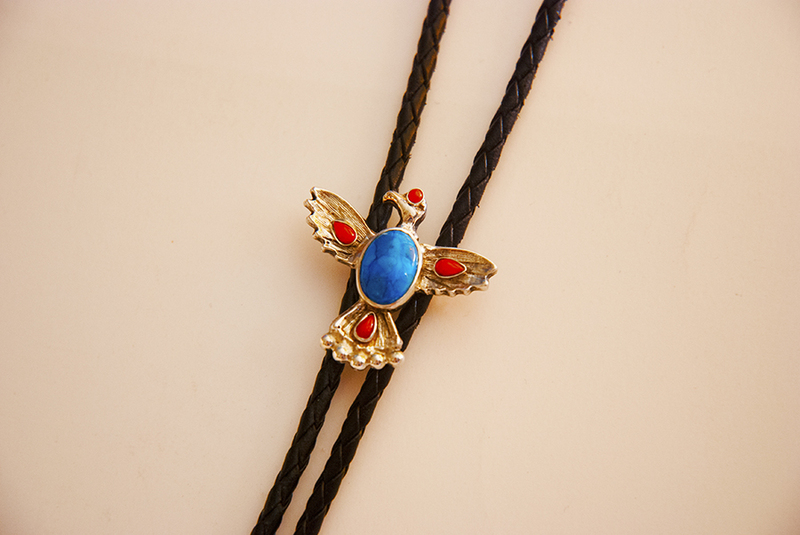 Click here for information about the above bolo tie "Sun Hawk"
In a nutshell the story goes as follows: after a long journey, a quest full of adventures and perils and overcoming adversity – during which he, symbolically, follows the legendary route³ the forebears of his People travelled as they migrated from the eastern Dawn Lands on the Atlantic seaboard to Lake Superior and beyond -, leads Snow Hawk (for that is his name) from the southeastern shore of Lake Huron all the way to Lake Superior’s Thunder Bay. There, on an island in the bay, close to the Thunder Mountain nowadays called Mount McKay, he manages to find a passage to the Sky World where he finds the beautiful thunder eagle woman he wants to marry. Despite of his bride-to-be’s warnings not to arise the anger of the Mishiginebig, the Great Horned Water Serpent Spirit, Snow Hawk decides to wrestle him in order to save the Animikiig (Thunder People). After Snow Hawk, who is capable of shapehifting into the raptor that had appeared to him in a dream, kills the underwater monster, the Thunder People thankfully accept him in their midst; he then is allowed to transform from a human/hawk into a Thunderbird and finally marries the love of his life. To read the complete story about Snow Hawk’s quest for Thunder Eagle Woman, and his transformation into a Thunderbird, see my blog story Giibwanasii and Thunder Eagle Woman. 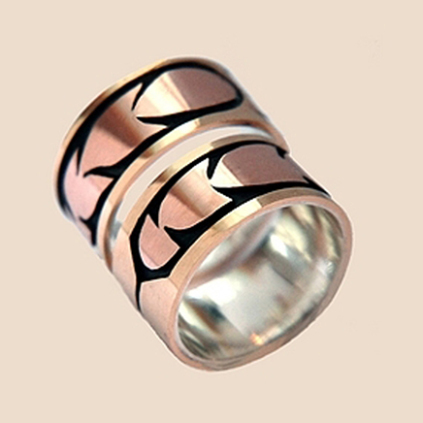 These unique, 0.39 inch wide graphic overlay wedding bands consist of 14K yellow gold; the feather inlays, stylized images of Gekeko-miigwanag (hawk feathers), are 14K red gold. 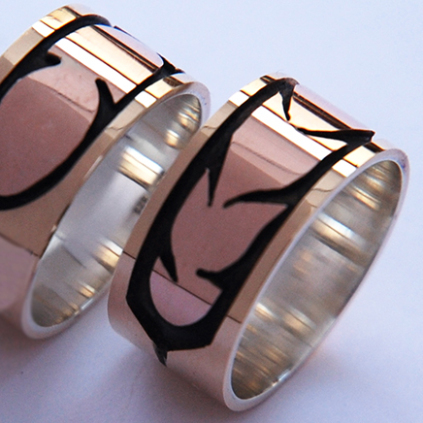 Both rings show oxidized⁴ recesses of sterling silver, which creates a dramatic contrast with the red gold feathers. Click here to read part 17 in the series Teachings of the Eagle Feather: "The Language of Our Hearts"
Mii sa ekoozid. Miigwech gibizindaw noongom mii dash gidibaajimotoon wa’aw dibaajimowin. And that is the end. Thank you for listening to me today, for allowing me to relate to you this story. Giga-waabamin wayiiba, I hope to see you again soon.